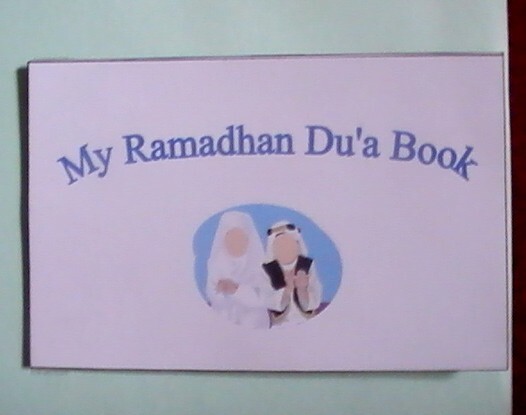 This is my son’s first Ramadhan lapbook and I know it will not be the last. We have had so much fun putting this together, masha’Allah. First of all, I really would like to give credit where credits due. 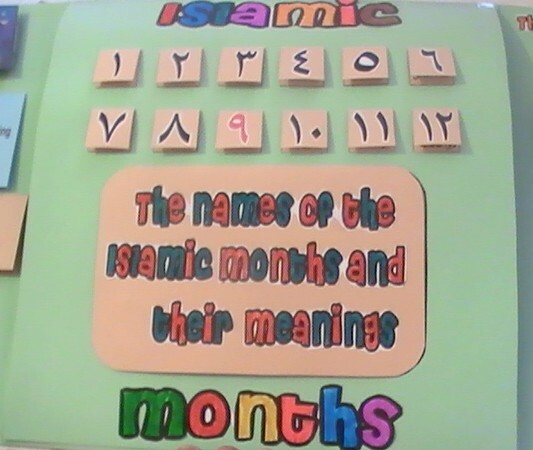 Alot of the templates for this lapbook came from Umm Abdul Basir’s blog which has been a massive inspiration to me. And also from the Raising Muslims blog. 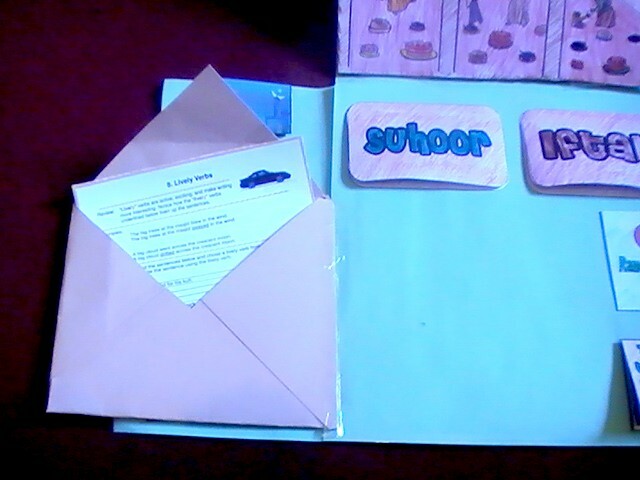 Both sisters have been kind enough to share their templates in PDF format, may Allah reward them abundantly, ameen. The templates for this particular lapbook can be downloaded via the links in this post. Below are some pictures of the lapbook with the pages unfolded. 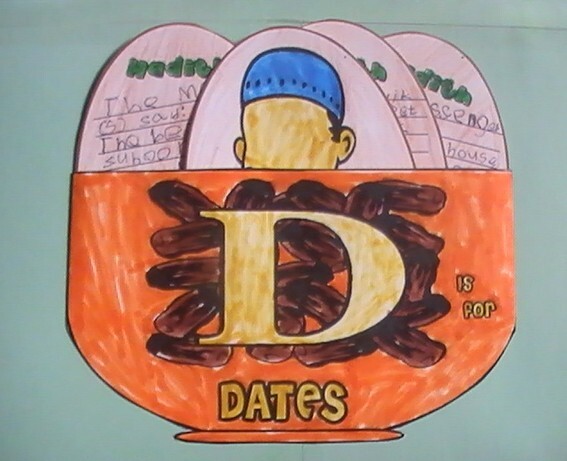 The first two flaps open to reveal a page dedicated to information on the Islamic months and as the pages unfold further, various other content is revealed including a pop-up iftar scene. When the front flaps are opened, the first page to be seen is dedicated to learning the Islamic Months. The 12 months are written inside the flaps and the Arabic numerals are pasted onto the front of the flaps. 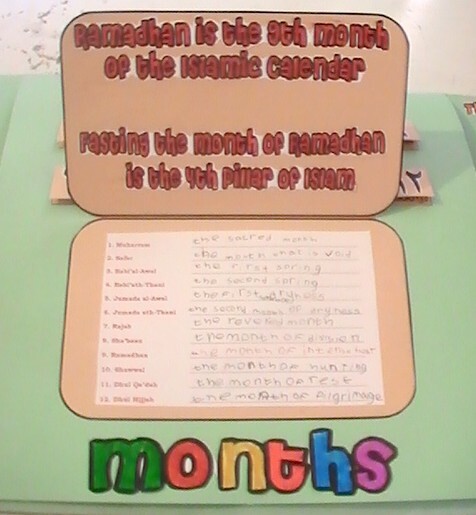 The tes’ah (number nine) is highlighted in red because Ramadhan is the ninth month and that is the obvious focus of this lapbook. 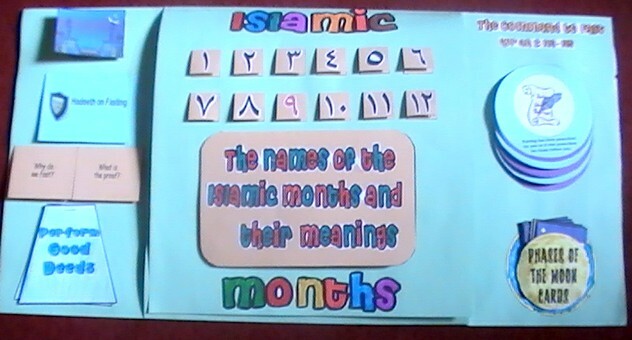 If you would like the Islamic months template, you can download it here. When the central flap is lifted it reveals the names of the Islamic months and their meanings neatly written out by my son. 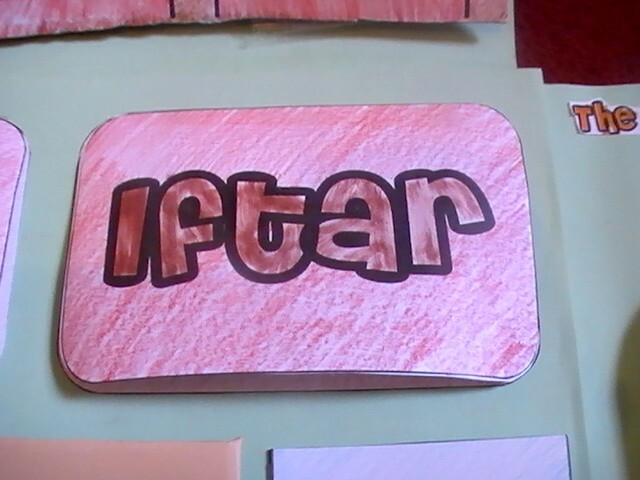 He also coloured in some block font statements about the month of Ramadhan on the opposite side of the flap. When the Islamic months page is folded over it reveals a pop-iftar scene. 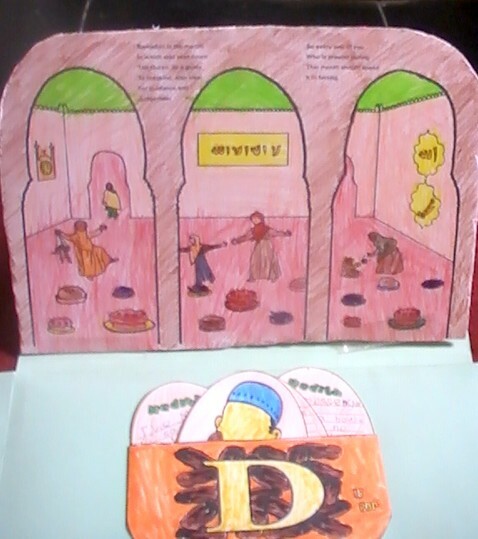 My son coloured the iftar scene then we pasted it onto some corrugated card to make it sturdy and attached it to the page using some strips of card in such a way that it would stand up when the page was turned over. You can find a copy of the iftar scene colouring page here. Below the iftar scene is a page with details on Suhoor, Iftar and Zakat ul Fitr. 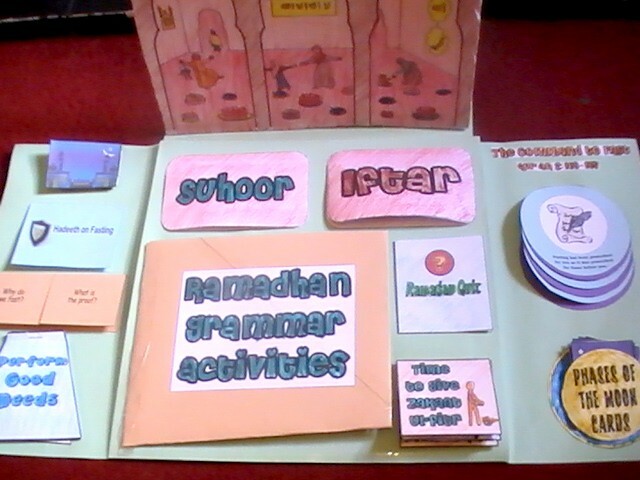 It also contains an envelope with Ramadhan theme grammar worksheets. 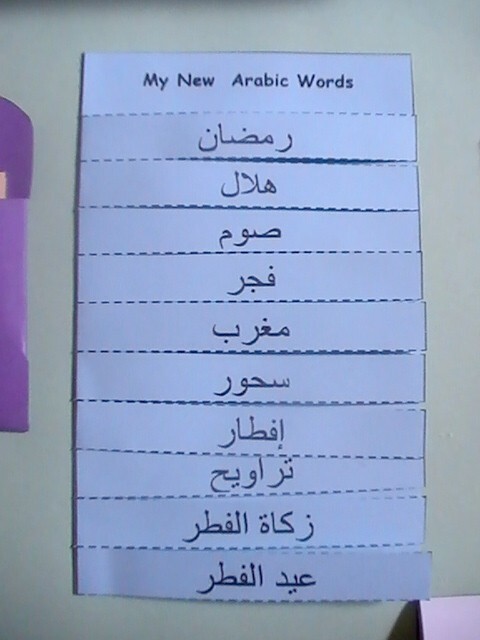 I found these worksheets at the TJ Ramadan website. 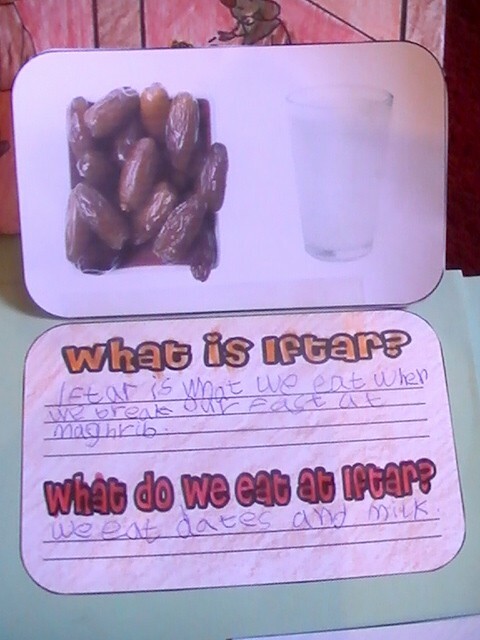 We made a couple of flaps to learn what is Suhoor and what is Iftar. 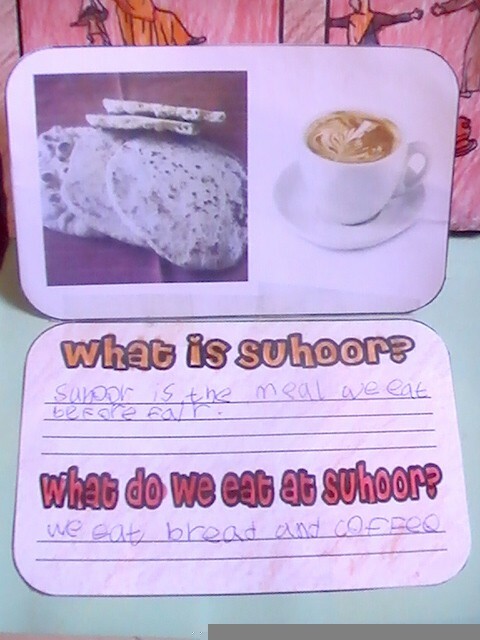 We pasted on some pictures of the things we eat and drink at Suhoor and Iftar in our house. 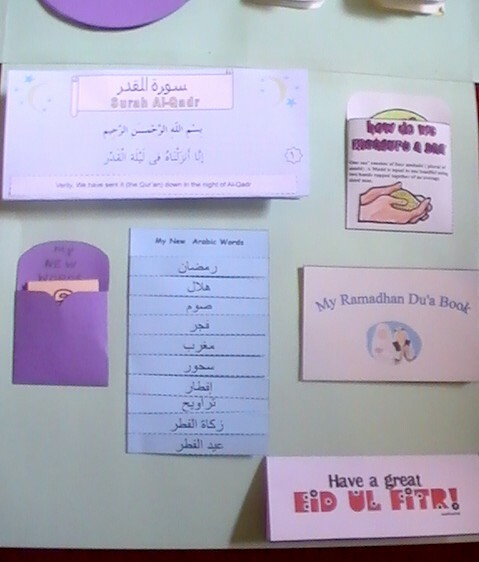 Then I had my son complete a Ramadhan Quiz and then we cut it out and turned it into a mini-book. 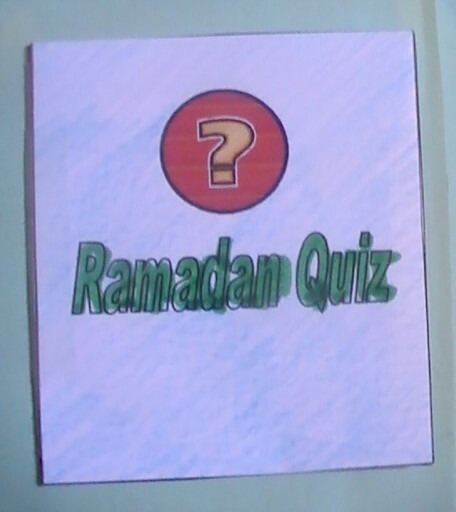 If you would like the Ramadhan quiz you can find it here. 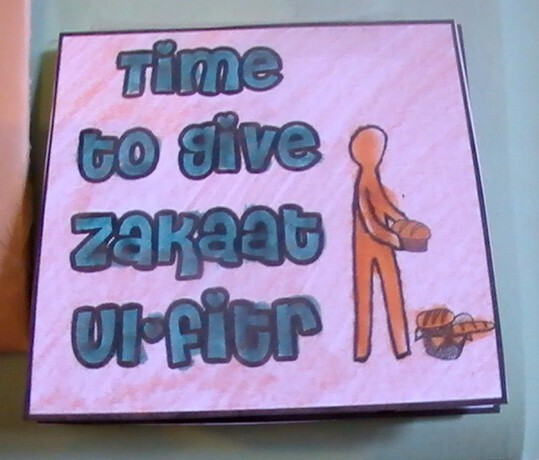 Next we put together this wonderful little tracer book about Zakat ul Fitr. Each page shows a different kind of food that one could give, according to the Sunnah of Zakat ul Fitr. If you would like the template for this Zakat Mini-book, you can find it here. 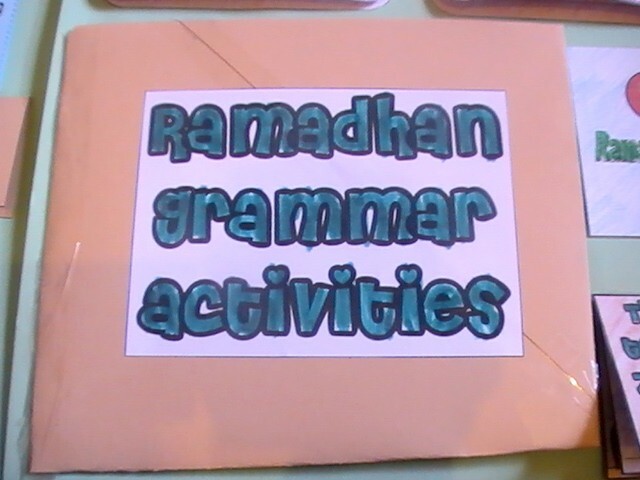 We made an envelope to hold some Ramadhan Grammar worksheets that my son completed. We taped the envelope to the lapbook page like a hinge so that it could be easily flipped over to put the worksheets inside. 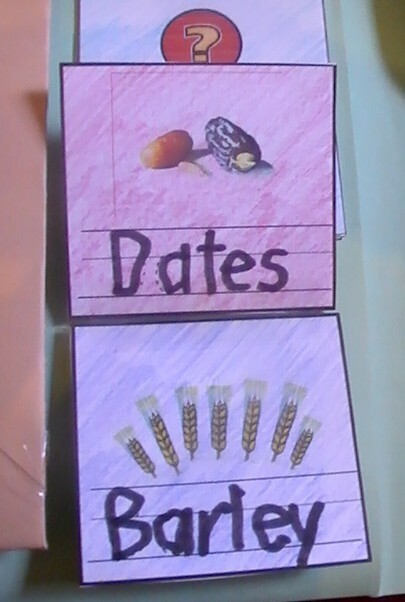 Next up, we made this wonderful dates bowl pocket with date-shaped cards. 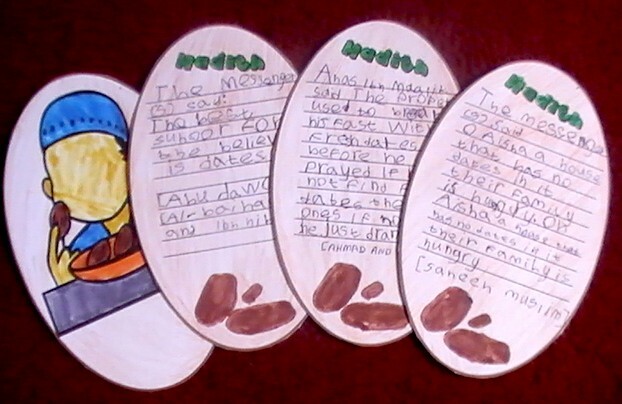 On each of the cards I had my son write a hadith about dates. If you would like this template you can download it here. I’m sure you’ve all seen something like this before. 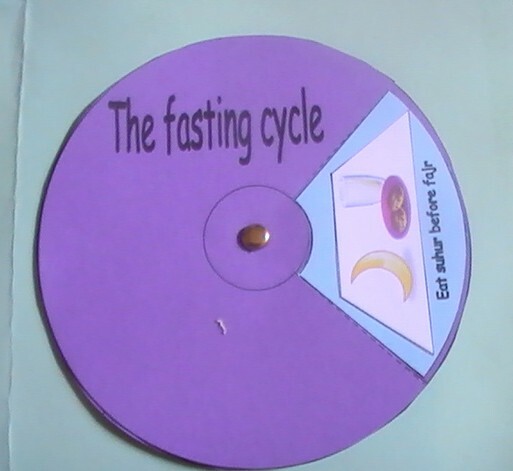 This is a pin wheel showing the Fasting Cycle. It shows four stages: Eat suhoor before Fajr; No eating or drinking during the day; Eat iftar at Maghrib; Eat and drink at night. If you would like the Fasting Cycle template, you will find it here. 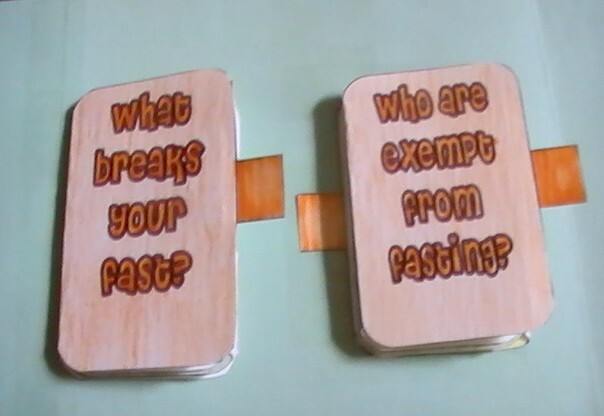 These are mini fold out accordion books that discuss what breaks ones fast and who are exempt from fasting. 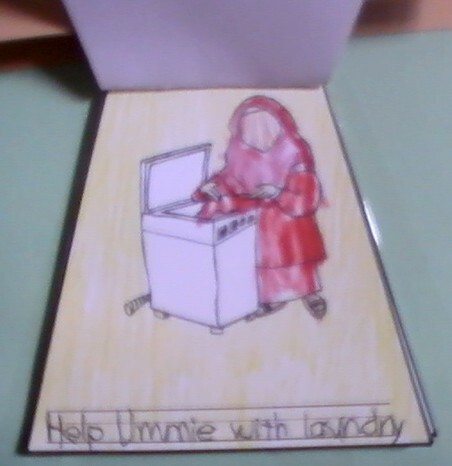 This is what the accordion book looks like folded out. There is a template available for this activity but I personally found it a little too small to hold the information so I used it as an example to create my own in an MS Word document. I discussed all the points with my son before he typed them up into the template to make sure he understood and then I printed it and got him to colour it in. If you would like a template for this activity, you will find it here. 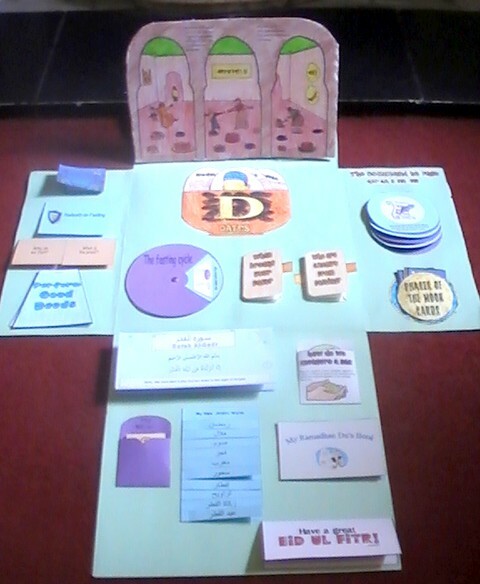 Above is a circle flap book that we made which focuses on the Command to Fast from Surah Al Baqarah. 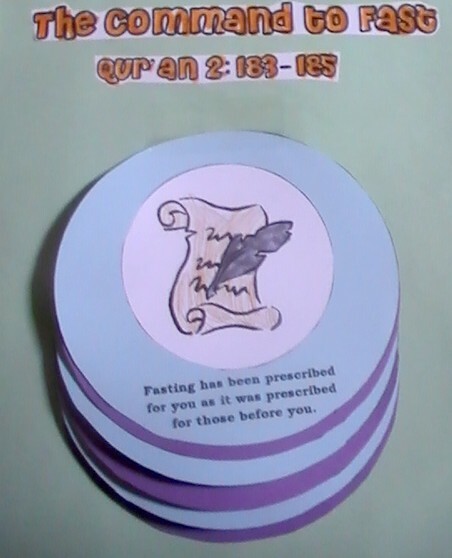 This started out as a colouring page which we cut up into sections and pasted onto cardstock to help understand the verses better. 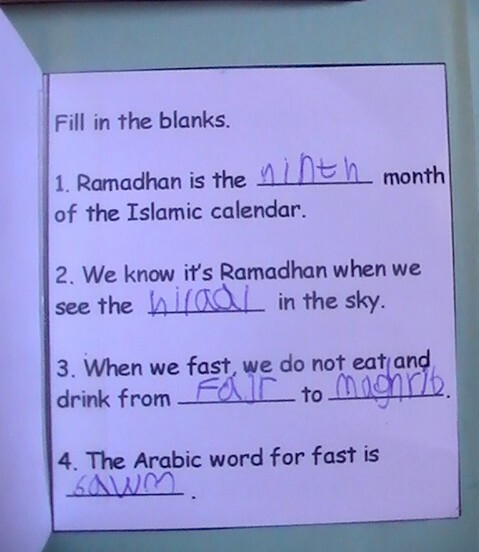 The colouring page for the Command to Fast can be found at the TJ Ramadan website. 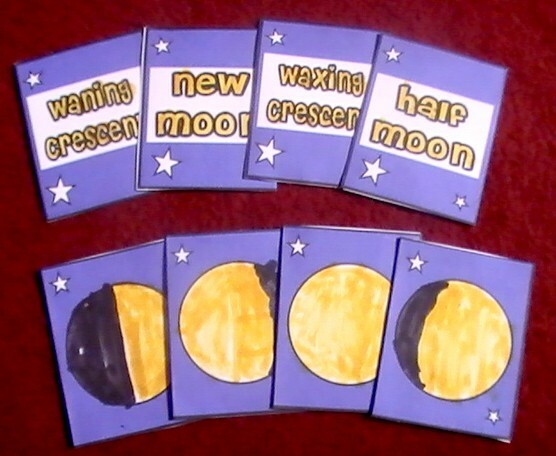 Next we made some cards which show the 8 phases of the moon. 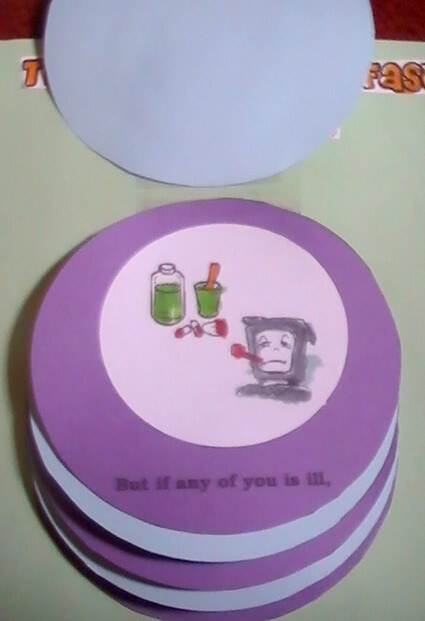 I modified this activity from the template flash cards available here. And the pocket to hold the cards is available here. 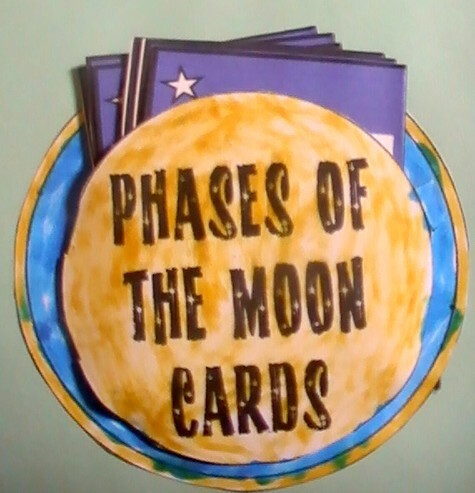 The flash cards on the website only show 4 phases of the moon, but last Ramadhan I did some moon phase activities with my son which show 8 phases of the moon and so I modified these cards based on the 8 phases. This is a spelling pull out tab which spells RAMADAN. This was my daughters contribution to the lapbook. She coloured the tabs. If you would like the R-A-M-A-D-A-N spelling tab you can find it here. 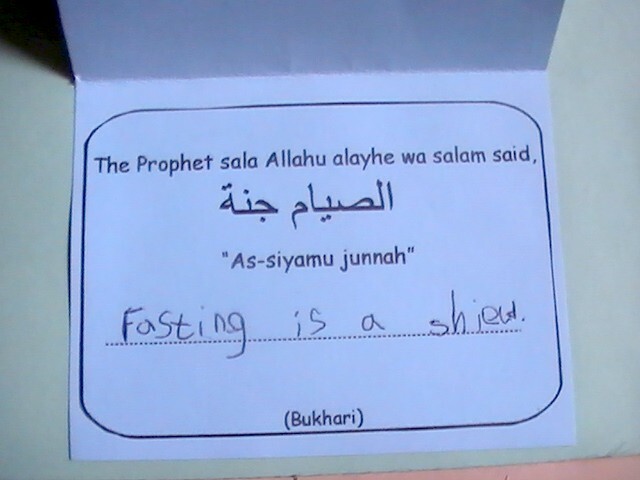 This is a small flap with a hadith about fasting. 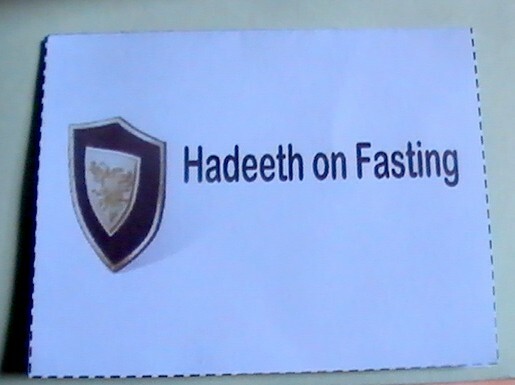 I explained to my son that it means Fasting is a Shield and asked him what he understood by that. I explained to him how fasting is a shield from the Hell Fire and from the temptations of the Shaytan. If you would like this hadith flap you can find it here. 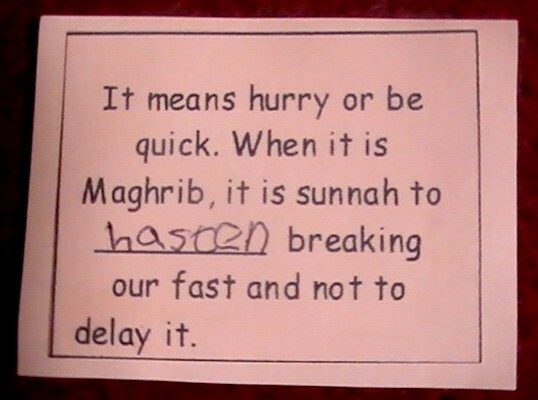 Next we looked at the obvious question: Why do we fast? 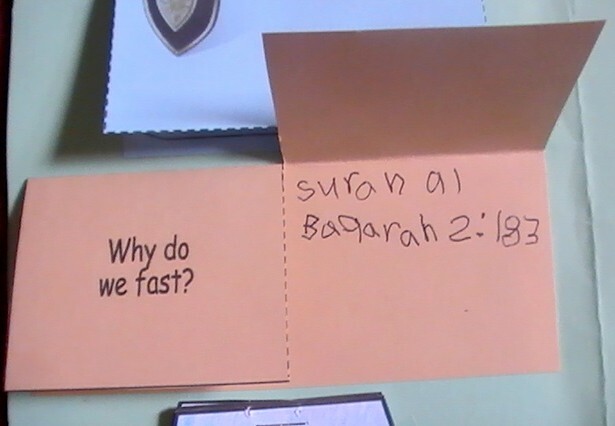 We had already gone over the command to fast from the Qur’an and the answer simply is that we fast because Allah told us to fast, so this is what my son wrote under the first flap and then under the flap ‘What is the proof?’, he wrote the verse reference from the Qur’an. If you would like this template you can get it here. 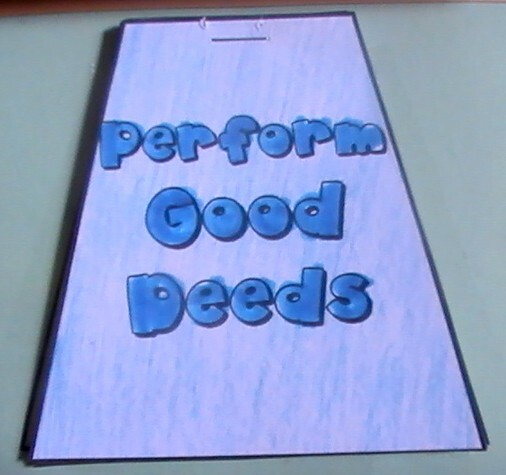 Next up we made a nice little book all about good deeds. We had a little discussion about how we can do good deeds and I explained how Allah rewards us for our good deeds insha’Allah, and how the rewards for good deeds are multiplied many times in Ramadhan, masha’Allah! These are a couple of examples of the pages from the good deeds book. I made a point of mentioning the ‘Share with your sister’ one first being as he is the only boy and having 3 sisters. And I have referred him back several times since LOOOL! If you would like the Good Deeds mini book, you can find it here. This is another page folded out with various mini books attached to it. 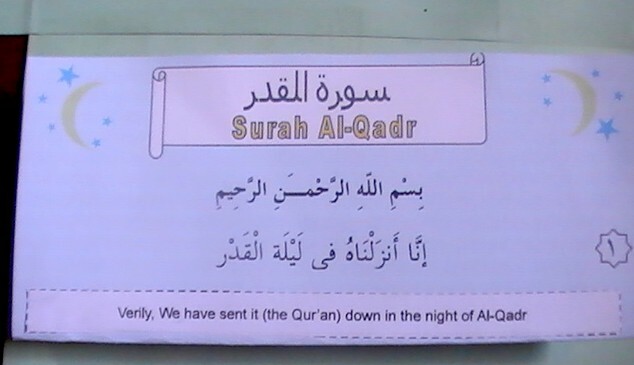 This is a nice little activity for learning Surah Al Qadr and it’s meaning. We looked at each ayah, I explained a bit from the tafsir of this Surah to my son and then I had him tell me in his own words what he understood from this surah. Then after reading the surah a few more times, we did the activity and pasted the translations of the ayat under the Arabic. You can find the Surah Al Qadr activity here. 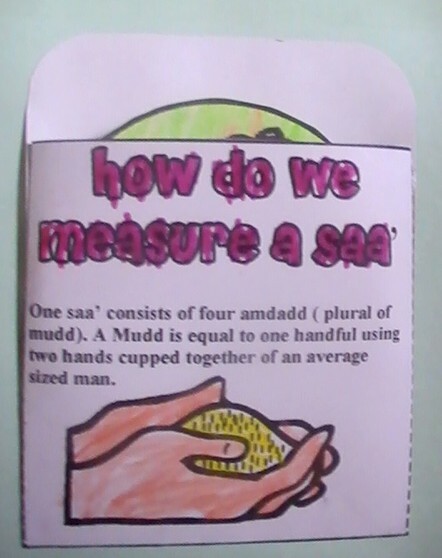 Then we did a fun activity to learn about Zakat ul Fitr and how to measure a Saa’. 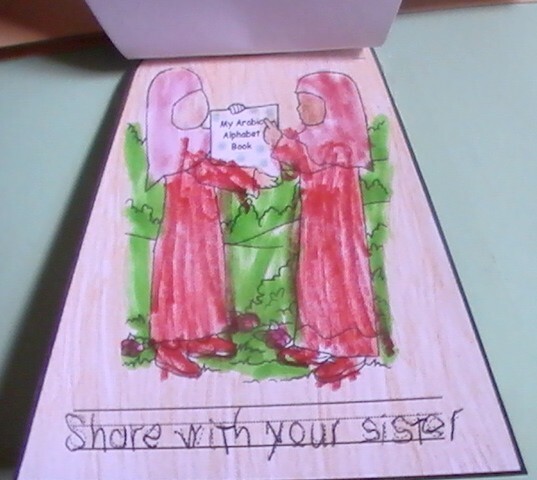 There are 6 of us in our household, masha’Allah, so I had my son colour 24 of the amdadd cards to represent how much each of us will need to give to cover our zakat ul fitr. Then we used the cards to do a bit of zakat maths using multiplication and addition. If you would like this activity template you can find it here. We put together this little book of du’a relevant to Ramadhan. if you would like this template you can download it here. 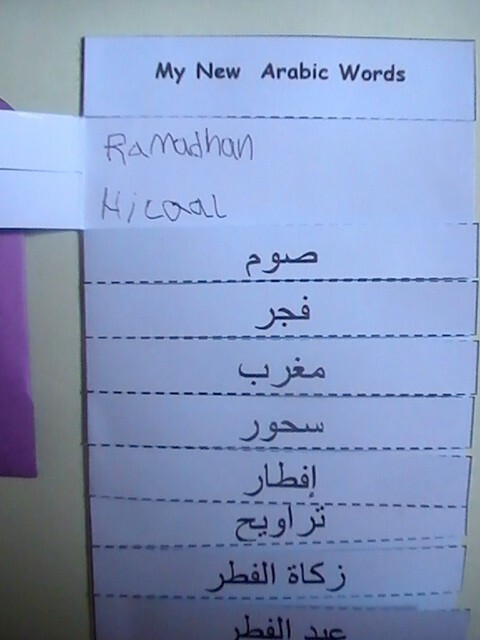 We learned a few new Arabic words and their meanings, all of which are relevant to Ramadhan. I let my son tell me first in his own words what he thought each of the words meant and then I added in anything that he may have missed. I left this activity to almost the end because most of the words had come up during the other activities and I wanted to know how much he had understood and remembered, masha’Allah. 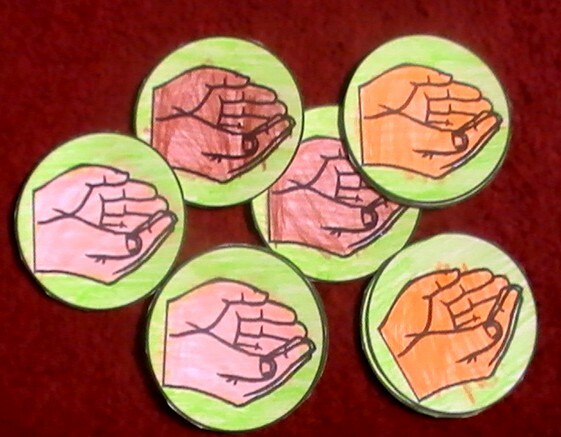 If you would like this activity you can find it here. We also learnt some new English vocabulary. 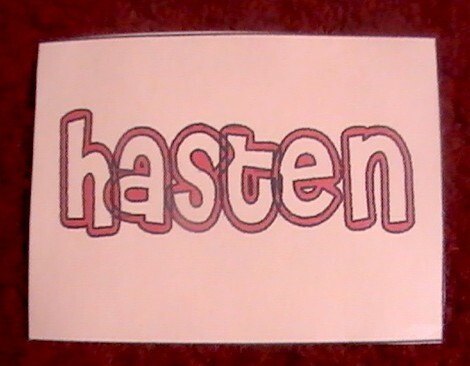 These words had come up during the activities whilst making this lapbook. 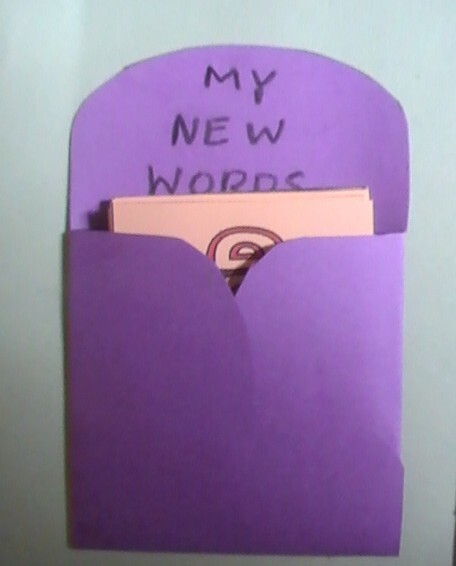 We made a little pocket to keep the new words in. The new word is written on the front of the card and the definition is pasted on the back. 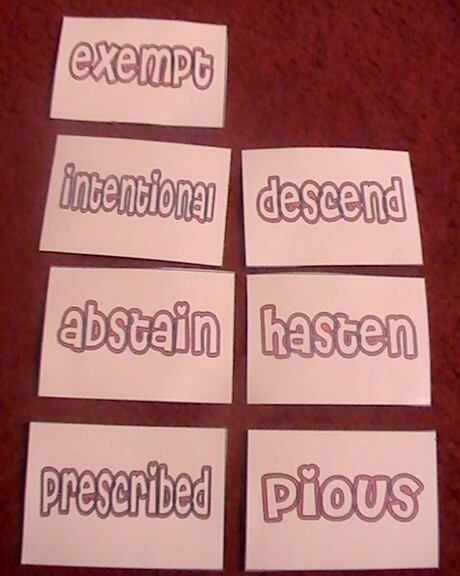 If you would like these vocab cards, you can find them here. 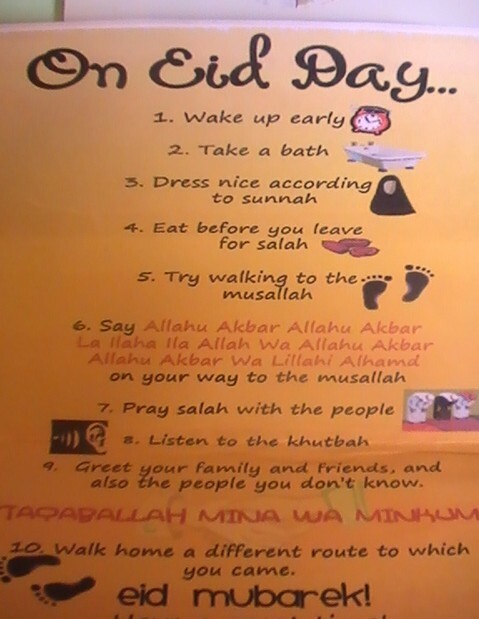 Finally we made this little tri-fold page which covers the etiquettes step by step on the day of Eid ul Fitr. If you would like to use this template, you can download it here. 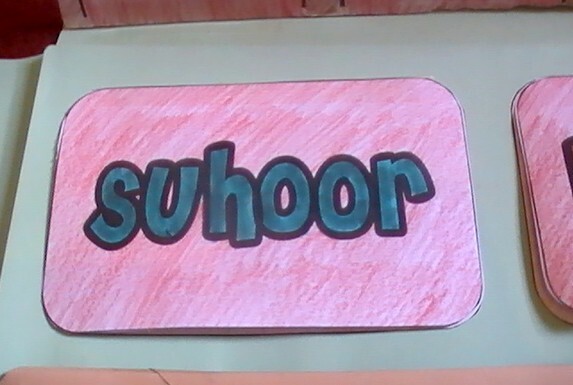 MashAllah sister, you have created a beautiful lapbook with your kids. Although we are half way through the month of Ramadan we will follow your wonderful example and try to make one. May Allah reward you for your efforts. Amin. Jazaki’Allahu khayran UmYusef for your lovely comment. 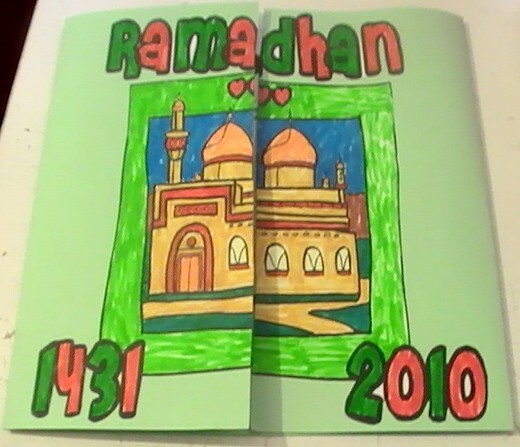 Insha’Allah you will have just as much fun as we did making this lapbook. Very much looking forward to seeing your new tot book … becoming a tot book addict myself LOL! mashallaah sister this is so beautifully done, jazaakillaah khair for sharing it.